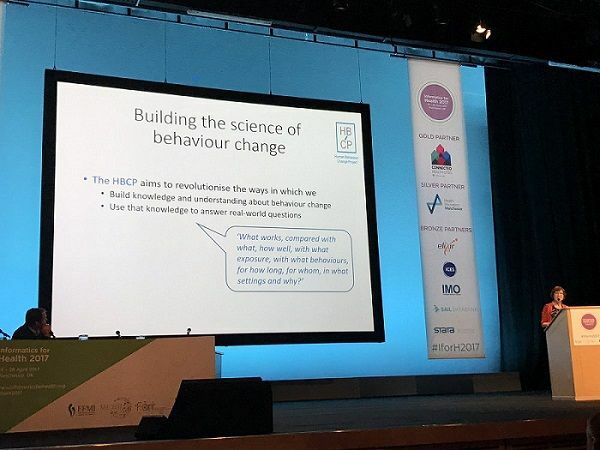 Principal Investigator of the Human Behaviour-Change Project (HBCP) Professor Susan Michie presented a keynote address at Informatics for Health 2017 in Manchester this week. During her speech Prof Michie explained how HBCP is bringing together expertise from the computer and information sciences with that of behavioural science to transform the way evidence is synthesised to address ‘real-world’ questions and generate new understandings about behaviour change. The project aims to synthesise what is known about health behaviour change from published reports and generate new insights to benefit population health, using machine learning and artificial intelligence. HBCP will develop an ontology of behaviour change interventions: a structure for organising knowledge using well-defined shared terms for entities and the relationships between them. This is the first formal introduction of HBCP at a health informatics event, with experts in ontologies, content mining and big data in attendance. The keynote generated excellent discussion and many suggestions for collaboration. More information on the aims and vision of HBCP can be found here. Professor Michie’s keynote slides can be found here. Follow us on Twitter @HBCProject and check out Twitter coverage from the event using #IforH2017.